Olympus M.Zuiko Digital - Wide-angle lens - 12 mm - f/2.0 ED - Micro Four ThirdsThis high-speed, single-focal-length, wide-angle lens is ideal for shooting high-quality, dramatic landscapes and street scenes in low-light conditions. It has a beautiful full-metal body and a snap ring that enables photographers to pan focus with a distance indicator. 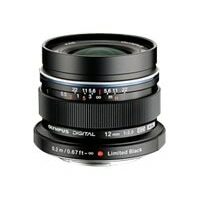 One of the most interesting features of this lens is the flexibility of its focusing system. While this is a so-called “focus-by-wire” lens – which means movement of the lenses focusing elements are controlled by an electric autofocus motor instead of a mechanical linkage – it offers two distinct manual focusing options. Choosing is as easy as moving the snap focus ring that activates the lens’s Manual Focus Clutch mechanism.